Every year Kyoto's citizens have a parade at the Miike Boulevard when the Kyoto Festival approaches autumn. 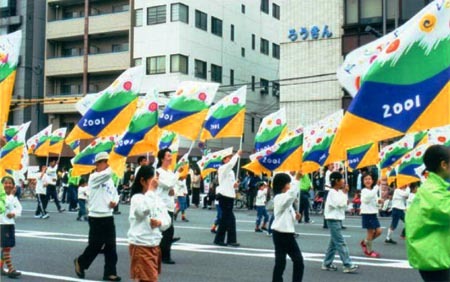 In 1998, any individual could join the flag team: old, young, or even wheelchair-bound, because it was the 100 year anniversary of Kyoto's autonomy. I made flag in a way that when it was flown, wind of joyful smile blew into the town. Kids teams wore their sweat shirt and bandanna as uniforms. They looked cool.